… must come down. After the first across-the-board rise in every complaint category (since early 2016) in August, we are now looking at a significant across-the-board drop in every category for September. How significant? 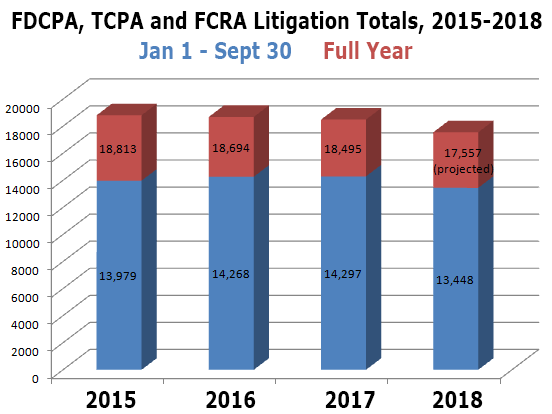 Every category is down by double digits, from 16.8% (BCFP complaints) to 31.5% (TCPA complaints). What does this mean? Usually, not very much. Year-over-year, these numbers have tended to be remarkably consistent. However, if trends hold, litigation this year is on track to be about 5% lower than the last several years. That is not huge, but it is not insignificant either. In other news, putative class actions were mixed last month with 22.6% of FDCPA, 29% of TCPA and 3.2% of FCRA lawsuits filed that way. An unusually high 37% of all plaintiffs who filed suit last month had filed at least once before. And finally, New York attorney Craig B. Sanders represented more consumers than anyone else in September (51) and also has represented more consumers than any other attorney all year (429, more than a hundred above his nearest competitor), retaining the title of most active consumer attorney of the year. 3106 consumers filed BBB complaints, 3686 consumers filed BCFP complaints, and about 1054 consumers filed lawsuits under consumer statutes from Sep 01, 2018 to Sep 30, 2018. Of those cases, there were about 1054 unique plaintiffs (including multiple plaintiffs in one suit). Of those plaintiffs, about 391, or (37%), had sued under consumer statutes before. Actions were filed in 150 different US District Court branches. About 699 different collection firms and creditors were sued. There were a total of 3106 BBB complaints from Sep 01, 2018 to Sep 30, 2018. That is down -27.9% from last month. There were 3686 complaints filed against debt collectors from Sep 01, 2018 to Sep 30, 2018. This includes 3494 (95%) timely responses to complaints, and 192 (5%) untimely responses.